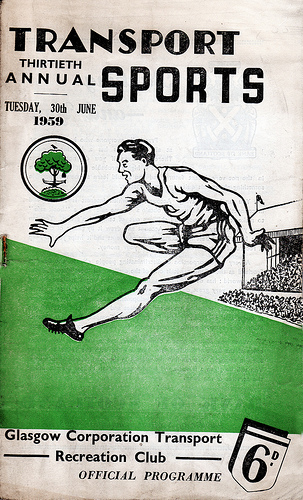 One of the most popular athletics meetings in the West of Scotland for several decades was the Glasgow Corporation Transport Department Sports (it was actually known as the Glasgow Tramways Recreation Ground) at Helenvale held in the evening, mid-week, it attracted at one time or another most of the big names in Scottish athletics and national records were set at the meeting. 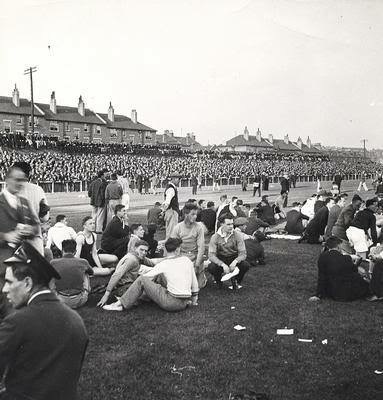 It was a narrow track and the terracing was relatively small compared to, say, Ibrox or Cowal so that the crowds which turned up (see the photo above) created a tremendous atmosphere. There are many stories about the venue – Dunky Wright getting carried away at a long sprint finish between Alex Brown (Motherwell) and Harry Gorman of Springburn referring to the leader at one point as ‘Harry Springburn’. In this short article we can concentrate on the post war period, particularly the 1950;s which were arguably the heyday of the Glasgow Transport Sports Meetings. “Who will be the first Scottish champion of the post war era? Resumption of the 10 miles track championship takes place on Saturday, April 27th at Helenvale Park and should provide a yardstick of comparison with pre-war form. As most of the contenders will be found from the ranks of the ill-fated international cross-country team it would be difficult indeed to predict a probable winner. Favourite prior to the international would have been JE Farrell but if Jim Flockhart elects to start he has shown that in the mood he is still a menace to the best of Scotland’s distance experts. Despite Emmet’s reservations, the championships went ahead and in the next issue of the magazine the following report appeared. The 3 miles walking championship only attracted four starters, including the holder, A. M. Jamleson. Dundee Hawkhill. The champion Jumped Into the lead at the start, and with Ills snappy action soon set up a big lead and eventually won by over -100 yards from Crossley, Edinburgh II. The winner’s time was 24 mins. 7.0. 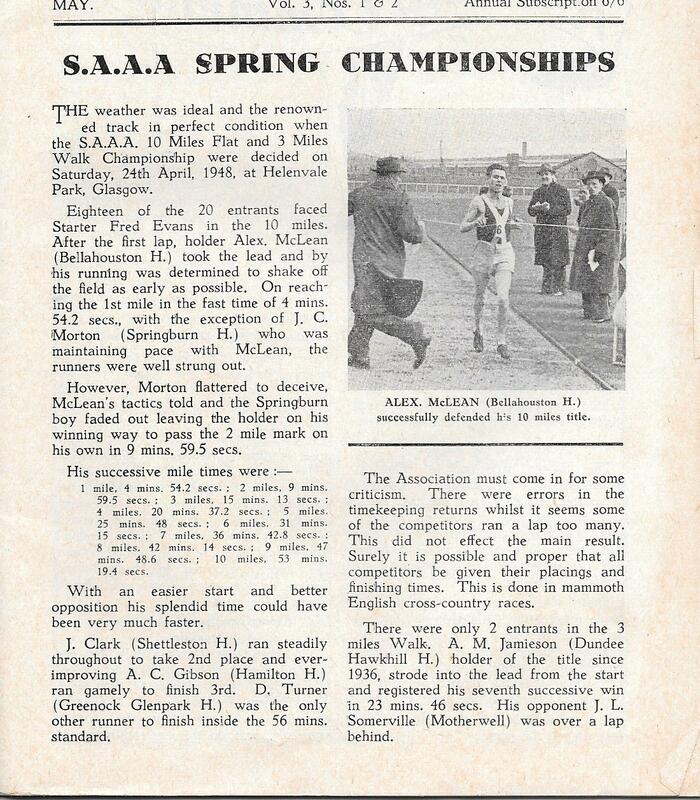 Without any intention to detract from the worthy performance of the Dundonian in winning the title for the fifth successive time, this event did not come up lo championship standard It is a fact that this event just escaped excision from the S.A.A.A.”s list of championship events and.judging from the meagre support which has been given to it in pre-war years It would appear to he in danger of complete extinction in the near future. True, this race has been endowed with a handsome Challenge Trophy, gifted by the late George Hume, a walking enthusiast, but even this circumstance may not save the event from its distinction as a Championship item in the S.A.A.A. sports calendar unless better support is forthcoming. “A fairish crowd of Club members and old-timers came along to Helenvale Park to give vocal encouragement to the contestants in the S.A.A.A. Spring Championships, on Saturday, 26th April, 19-17. Starter Fred Evans sent a full turn out of 10 away on their long. long trail in the 10 miles, and as soon as the field turned into the strong wind that was blustering down the finishing straight, there began a game of ” wait and see,” among a group of 10, nil more or less reluctant to assume the punishing role of pacemaker. This went on for fully three miles, with the holder, J. E. Farrell (Maryhill), never allowing himself to get “boxed,” yet never taking the lead: a tactical manoeuvre which looks so easy—until you try it. A third mile of 5.35 — obviously this could not go on. and at 8 miles Farrell suddenly dashed down the stand straight with the wind at his back. The race fizzed up: two more helter skelter rushes in the next laps spreadeagled the field, leaving only Farrell, A. MacLean (Bellahouston H.) and A. McLennan (Shettleston H.) running together. Half-distance in 27.7 (good for the conditions), and then MacLean challenged the holder at his own game by piling on the pace down the back straight. The sixth mile, second fastest of the entire ten. was the deciding point of the race: MacLenn’s electrifying dashes downwind Increased his load over Farrell by 15 yards each lap. and finished Mclennan. His thoughts might have been refined by the fact that the SAAA championships were on the 21st and 22nd June, while the Transport Sports were on Tuesday 24th and he could compare them with some accuracy. Note the dates. The Transport Sports were usually the Tuesday after the national track and field championships and so coverage was scanty – the events were not always reported in the Press. 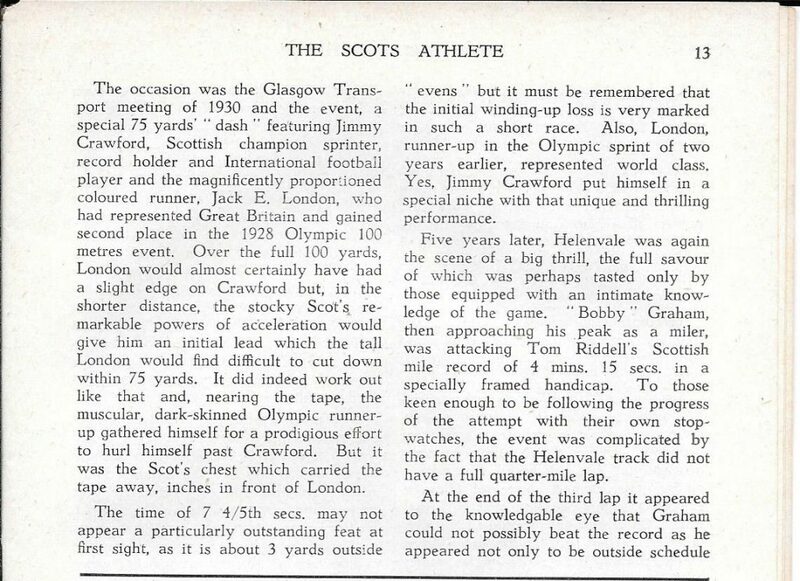 The championships were held at Helenvale for the third time in 1948 and we have the report from the ‘Scots Athlete available again. John J Barry, the St Machan’s and Clonliffe Harriers (Eire) runner created a world record for the one and a half miles at Helenvale Park last night when at St Machan’s sports meeting he covered the distance in 6 min 3.5 sec. Barry’s time was 2-10ths faster than the previous best made by Glenn Cunningham (USA) in 1937, and 2.7 sec faster than the British record made by Tom Riddell (Shettleston) in 1935. Withe Scottish Mile and Three Miles champions J Fleming and A Forbes running from 20 and 25 yards respectively, Barry covered the first mile in 4 min 22 sec and had his field well in hand. Round the last lap he put in a superb effort to beat W Lennie (Vale of Leven Harriers) to whom he was conceding 85 yards, and won by 30 yards. Proof of the quality of the track if any were needed. But note also that the winners were ordinary club athletes competing in handicap races, changing in the same dressing rooms, sitting side by side on the infield with the top men. It was a feature of such meetings as the Rangers Sports in Glasgow and the Edinburgh Highland Games at Murrayfield at the time. The inspirational effect on club runners was great. In 1950 the Glasgow clubs inter-club championship was scheduled for Helenvale on 13th June but the big event was the one to be held later in the month. 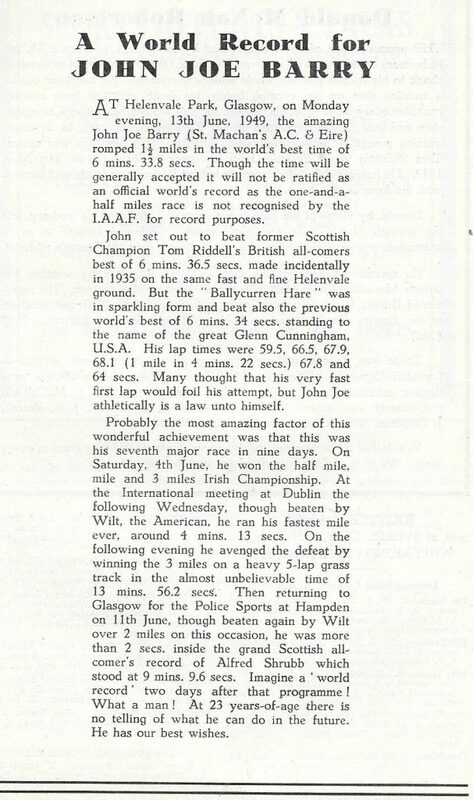 Despite the fact that the Transport event was on 27th June only four days after the SAAA Championships, where he had won an epic Three Miles victory over Andy Forbes, in 1950, John Joe was back in action. 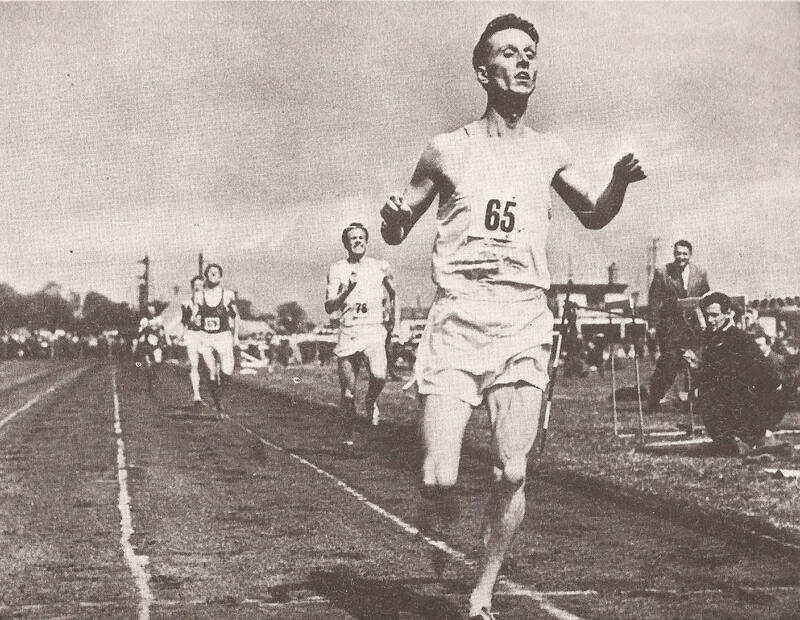 This time he won the mile in the excellent time of 4:12.1 – only 1.1 seconds outside Wooderson’s all-comers record. His lap times were 61, 64, 66 and 61.2 against the Englishman’s 60. 64. 66 and 61. 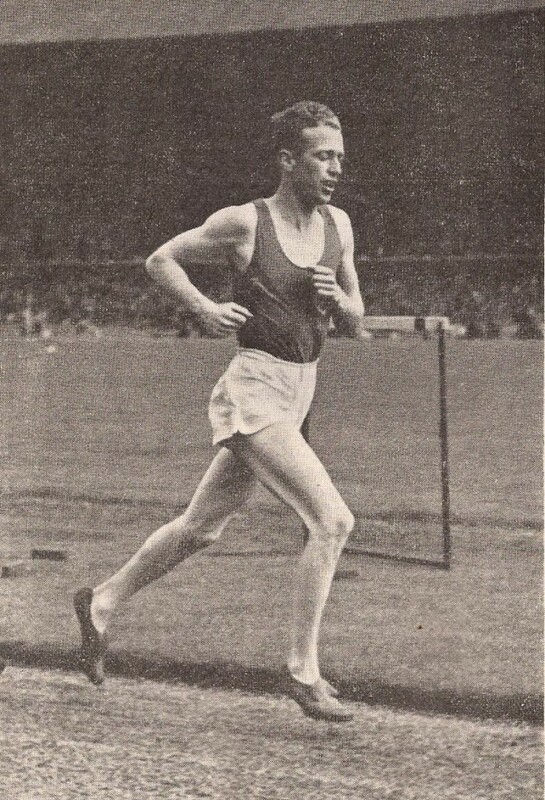 Incidentally John Joe ran the next day in Dublin where he won the Two Miles Invitation from Douglas Wilson – and Andy Forbes – in a world record time. 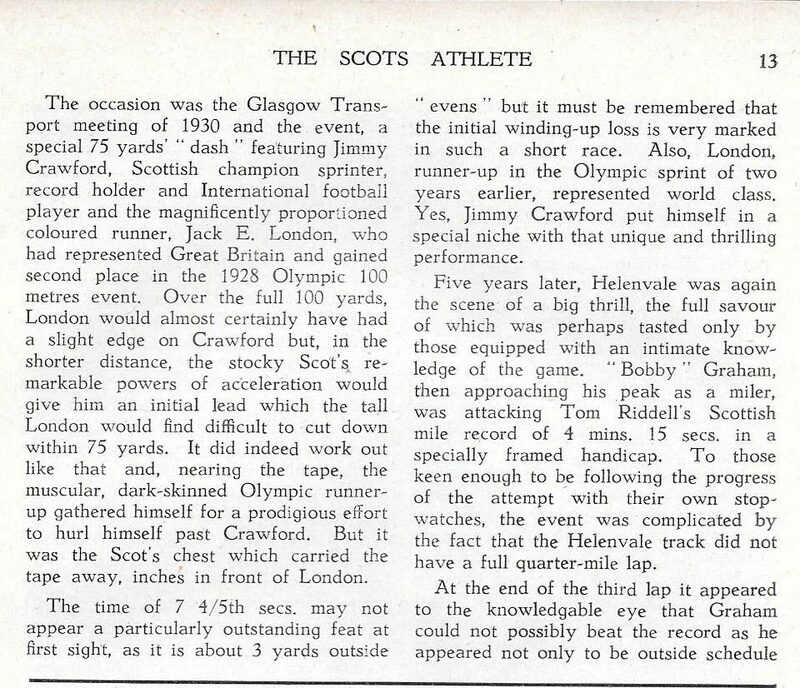 The ‘Scots Athlete’ commented on the relay in its July 1950 issue as follows: “Once again it was proved that when athletes are in good form, the Helenvale track is the place to do justice to it. Glasgow University whose men ran with grace and verve beat Bellahouston Harriers great record of 3 min 32.9 sec set up in 1938 by 1.2 sec – the new time being 3 min 31.7 sec.” The winning team was Tom Begg, Robin Ward and JH Paton, and DK Gracie. Two Miles: E Bannon, Shettleston, 9:23.5. Team: Victoria Park. Mile Medley Relay: Manchester AC . Maybe they were right to keep to the ‘Tuesday after the National ‘ pattern after all. Some other results from the night: 100 yards/220 yards: G Rodger (Clydesdale) 7 1/2 and 16 yards; 880 yards: A Small, (Plebeian H) 26 yards; Mile: I Cloudsley (Shettleston) 150, 15 miles road race: H Lawrence (Teviotdale H); there were also cycling, wrestling and five-aside football in which Celtic beat Third Lanark 4-1. In the Transport Sports on 29th June there were good performances but no records or record equalling feats on view. On a cold, wet night, the two miles was the race of the evening: won by John Stevenson of Greenock Wellpark from his brother Tom with Eddie Bannon (Shettleston) third. Despite only needing three to score for the team race, Wellpark were second n the team race – one point behind Victoria Park. J McLauchlan (Maryhill – 3 yards) won the 120 yards special short handicap invitation from D McDonald (Garscube – 2 yards) and R Quinn (VPAAC – 1/2 yard) was third. 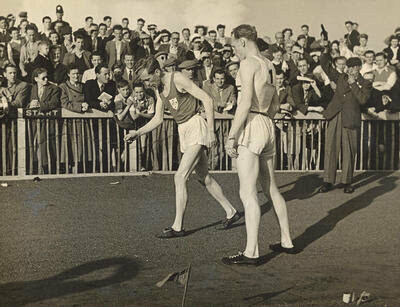 Jack Brown of Dumbarton won the 220 and Eddie Sinclair (off 145 yards) won the Mile. Two Miles – Individual 1. A Brown (Motherwell) 9:10.2. Team: Bellahouston: FG Nelson 2, J Connolly 5, R Penman 10 = 17 pts. It was still a good meeting but the atmosphere was changing slightly. However, given the SAAA habit of moving championships around to different venues, the West District Track and Field Championships came to Helenvale on 4th June 1957. With the Transport Sports on 25th June, it looked like a good month. The West District championships were held on two nights – Tuesday 4th and Thursday 6th June. 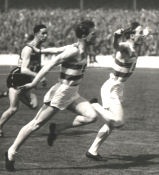 The Mile was one of the first events to be decided and Graham Everett won Hendry (also Shettleston) and WJ More (Kilmarnock). The 440 hurdles were won by Hunter of Jordanhill and the 440 by J McIsaac (VPAAC) from Boyd and Paterson of Glasgow University. Robertson of Glasgow University won the 100 yards from Dunbar of Victoria Park but the most exciting race of the night was the Six Miles. Andy Brown (Motherwell) with 30:29 won from Ian Binnie (VPAAC) and Bobby Calderwood (VPAAC). Came the Thursday session and the main actors were Robertson who ‘did the double’ by winning the 220 yards, and Brown who did his own double by winning the three miles, winning in 14:18.3. Fraser of Bellahouston won the 880 yards from Boyd (GUAC) and More (Kilmarnock) in 1:55.8. For many of the athletics watching public, a good hard fought half mile race is the most exciting thing in any track contest. A mix of speed, skill and stamina, not forgetting the elbows on the bends, it can be a wonderful spectacle. In the Transport Sports at the end of the month the most talked of event was just that event. Two Miles: Individual L Hendry (Shettleston) 9:18.8; Team Bellahouston Harriers. Everett enjoyed the half-mile in 1957 so much that he was back, running the same event – invitation, short handicap, special 880 yards – from scratch in 1958. 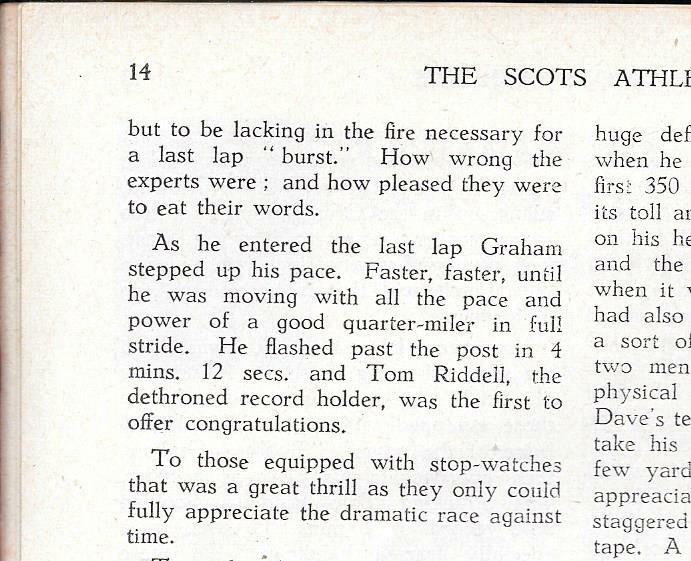 In the absence of Paterson his rival on the scratch mark was Donnie McDonald of Garscube, a fine quarter and half miler who was the Scottish champion at the latter distance. Coming through the quarter in 55.3 Everett set a new personal best of 1:51,6. There were many whose names would become familiar to the point of being household names competing that night – Crawford Fairbrother won the high jump with a clearance of 6′ 5 1/2″, with Alan Houston (both VPAAC) second with a jump of 6′ 3 1/2″. Ian Harris of Beith (international cross country runner who would go on to win the SAAA Marathon title. won the mile and Joe Connolly of Bellahouston won the two miles in 9:10.0. Mike Ryan of St Modan’s a future world class marathon runner, won the mile in 4:08 and Andy Brown of Motherwell YMCA won the two miles in 9:03.8. First the meeting was typical of many that had drawn massive crowds and top athletics talent alike to tracks around Glasgow in the 1950’s – Rangers Sports, Glasgow Police Sports, and so on. Many had already gone. The Rangers Sports had ceased to be in 1962, and maybe events like that put on at Helenvale had outlived their time. Second, the Commonwealth Games had come to Scotland in 1970 and did wonderful things for the sport: it certainly raised the profile of the sport and provided the youngsters as well as the ordinary club athletes with role models and exemplars in whose footsteps to follow. Although three of the athletes selected for the Commonwealth Games in 1970 competed and won there (Les Piggott, Mike McLean and Lachie Stewart) in Games year, it’s days were numbered. Third, Helenvale (and that’s what this is supposed to be about, was a good cinder track . There had been an allweather track at Grangemouth since the mid 1960’s, Coatbridge was not far behind, Meadowbank had its new state of the art track by 1969 – and Glasgow lagged behind. There were newspaper articles backed up by comments from international athletes about the lack of any all-weather track in Glasgow. Scotstoun and Westerlands which were used for championships and international meetings were still cinder. The athletes were looking for other surfaces to run on. For all these reasons, Helenvale stopped holding their popular meetings and eventually the ground was used for other things by the city. At one point in the 1980’s Eddie Taylor, when he was Scottish Staff Coach for multi-events, thought he could use it as a kind of centre of excellence for the various disciplines but nothing came of that. However, we have not yet looked at the pre-war period of which James Logan had such memories – we will have to go there.